Bed bugs have become a real problem recently, with more and more places reporting outbreaks. What can you do to avoid being exposed to these nasty parasites? If you do get exposed, what can you do to get rid of them (preferably before you bring them home!)? Well I'm a bit of a sub-expert on this, having worked nine years in the hostelling industry and encountering them as a traveller once in India. There's a bit of a dirty little secret in the hospitality industry about just how bad the bed bug problem has been for the past few years. Apparently all the big/expensive hotel chains have been having problems - it's not just dirty dives with holes in the wall that are affected. Bed bugs hide in furniture, cracks, under carpets, inside power sockets, etc. They love wooden furniture. Bed bugs only come out late at night. In my experience around 3am / 4am is prime time for them. They like to bite then move along a bit, bite again, move along a bit, etc. You will have little straight lines of small bites. Their bites don't seem to hurt and do not itch, but they do bleed a little. You will have little spots of blood on your sheets, pillow, pyjamas, etc. They look a bit like baby cockroaches. They can range in size from a tiny spot to about the size of the nail of your little finger. You can surprise them by turning the lights on suddenly and looking through the sheets and under the pillow. They don't move fast but seem to be able to hide pretty quickly. Bed bugs do not carry disease. They're yucky and I hate them, but you can't catch anything from them. Infestations of bed bugs are very hard to get rid of! This is because the eggs are harder to kill than the hatched bugs. It takes at least one or two weeks. We always call in professional exterminators. Individual bed bugs are easy to kill! Too hot or too cold will kill them. Wash all your clothes in hot water! Everything else of your luggage I recommend wrapping and sealing in tough black plastic bin liners and leaving in direct sun for at least a day or two. If you have an overseas flight, the low temperatures in the luggage hold will kill them! I don't know the details on how high and how many hours are necessary though. We're pretty sure we get ours from travellers arriving in Australia from Thailand. Bed bugs spread very easily! Tell your accommodation that they have them. It's up to them how to deal with them but if they are responsible the sooner they know they have a problem the better. If you move your stuff to another room or another hotel or hostel without the hot wash and black bagging I've mentioned you will probably spread them. Especially don't move to stay at a friend's place without taking those precautions! Would you believe, there's a website called BedBugSigns? It can be hard to tell if you've got them or not, because they are pretty small, only come out for very short periods, and because they are pretty good at hiding. First off, you should look for some key signs. Bites - You should be seeing little red bites on you without really knowing why. 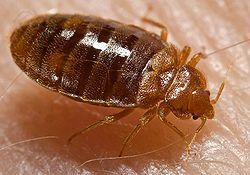 People rarely catch bed bugs in the act - they come out when you are asleep, and only bite for a short period. Also, like many bugs, you cannot feel the bite until a few minutes after it happens. The bites are very hard to identify - most doctors actually can't tell you for sure what they're from just by looking at them. Hiding places - Look in all the key spots where they could hide. This means the mattress and around it, folds in the linens, curtains, and nearby furniture. Look for the waste or dark spots. You probably won't see live ones, but they look like little mini-cockroaches. Catch them in the act - Keep a flashlight by your bed, and turn it on about an hour before dawn and watch the sheets closely for movement. Bed bugs usually bite around then, but if you get up or move too much they will go back into hiding. This can be hard to do - if you've only got a few of them, they only need to come out once a week or so anyway, so you might get unlucky and not see any, even though you have them. Carpet tape - This is a great way to do it. Get some double-sided carpet tape (it's tape designed to keep rugs stuck to the floor) and lay out strips around your bed, and on the sides of the mattress but where you won't run into it when you sleep. Leave it out for a few days. If you've got bedbugs, it's likely that at least a couple of them will get stuck on it. Serving as a volunteer in a larger city in the southwest US, I will share briefly some things I learned about a bed-bug infestation we had at our apartment (by no fault of my own, mind you). A lot of the homes we went into were teeming with little crawling surprises, and many of our appointments were at old homes with trashy yards. Anyway, I don't know exactly where they came from, but it's not too hard to figure it out... I got transferred into the area and apartment just after the infestation was discovered and measures were taken against it. hippitrail's answer was thorough and accurate from my experience. All our our mattresses and box springs were on the concrete in front of the apartment, sunbathing, eventually thrown away. The bed bugs don't like the heat. Before we got new beds we slept on counters, table chairs, anything that wasn't cushioned and was off the ground... we had a pest control guy come in and spray some crazy chemical all over; this seemed most effective. Interestingly... when we did get new beds, we were careful to check them daily especially in the creases of the mattresses and tight areas of the box springs. Bed bugs like tight places that squeeze a little, it seems. Even on our new beds we were getting bitten. The bites stopped the day I moved my bed away from the wall. Apparently, they were coming out from under the carpet (I think?) and crawling up the wall, into the bed, and biting. We kept our eyes open always and had over-the-shelf chemicals at the ready when we saw them crawling on furniture, us, or the walls. We tore apart the cushions on the chairs and couches, sprayed them with household chemicals, and let them sunbathe for a while before putting them back. Each evening when we came into the apartment, we undressed and washed the clothes right away. We kept all clothing off the floor and away from walls. Still, somehow I'd find little critters crawling around on my clothing. All we could do any more was kill each one we saw. By the time I left the area 4 months later, the bugs were gone: not a sight of a single one. Not the answer you're looking for? Browse other questions tagged health accommodation hotels hostels bed-bugs or ask your own question. How can I get an apartment in Riga, Latvia From the US?